ESPN: "In these dark economic times, there is still one beacon of light: Super Bowl XLII. America's corporations and citizens might be paring expenses and bracing for hard times in every other respect; but in metro Phoenix this week, the mantra is: Recession? What recession? 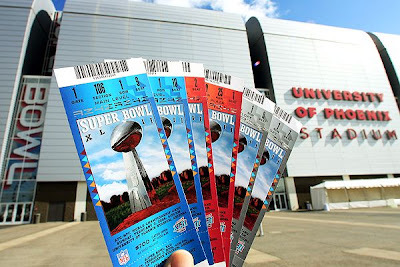 The bull market for Super Bowl tickets is the inverse of Wall Street's bearish one. The average price of tickets sold on StubHub is currently $4,227, a hefty premium from their face values of $700 and $900. Rooms at Scottsdale's 5-star resorts are going for $3,000 a night (four-night minimum)." Here's a follow-up graph to the one in the post below, this one is through 2007-Q3 for "foreclosures started," from the Mortgage Bankers Association(MBA). What is pretty obvious is that subprime mortgages in general are not the problem, but subprime ARMs that are the real problem. Subprime fixed foreclosures in 2007-Q3 were actually below the last peak in 2003-Q4, and still aren't much higher than FHA foreclosures. Foreclosures on prime fixed-rate mortgages haven't moved much at all in the last 5 years. Fortunately, subprime ARMs make up only 7% of the total mortgage loans outstanding according to the MBA, or about one out of every 14 loans, and of those subprime ARM loans outstanding, about 1 out 20 were in foreclosure in 2007-Q3, or about 1/3 of 1% of all mortgages. Interesting chart above from Freddie Mac, showing foreclosures through the middle of 2007. 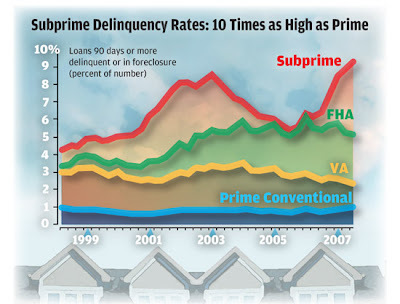 Note that delinquency rates for FHA and VA loans were declining in 2007 and flat for prime conventional mortgages, so the delinquency problems (at least through the middle of 2007) were affecting only the subprime mortgage sector. It will be interesting to see how this changes in the last half of 2007. Jan. 31 (Bloomberg) -- Germany's unemployment rate fell to the lowest level in 15 years in January. The jobless rate, adjusted for seasonal swings, dropped to 8.1%, the Federal Labor Agency in Nuremberg said today. Comment: We haven't had an unemployment rate in the U.S. above 8% in almost a quarter century, since December of 1983 (see chart above, click to enlarge), following the longest post-WWII recession in U.S. history (16 months). Territory size shows the proportion of worldwide GDP, equalised in purchasing power parity, found there in the Year 1 A.D. Territory size shows the proportion of worldwide GDP, adjusted for local purchasing power, found there in the Year 2002. From today's BEA report, "Real Disposable Personal Income increased 3.1% in 2007, the same increase as in 2006 (see chart above)." In fact, there has only been one year since 2001, when real disposable personal income has grown at a higher annual rate than 2007 - the 3.6% rate in 2004. The BEA reported today that Real Disposable Income grew by 2.1% in December from a year ago, the 24th consecutive month of positive growth (see chart above). Bottom Line: Real Disposable Income is one of the 5 economic recession-indicating variables watched by the NBER (the others are real GDP, industrial production, trade sales, and employment), and the 2.1% growth in December suggests that there is still no evidence yet that recessionary conditions are affecting the U.S. economy. Update: Graph now goes back to 2001. Territory size shows the proportion of all cars in the world that are found there. 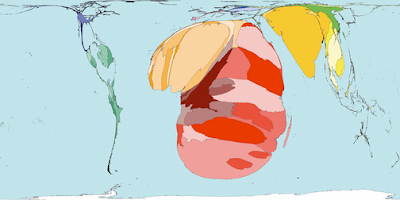 Territory size shows the proportion of all the motorbikes and mopeds in the world found there. Territory size shows the proportion of worldwide polio cases that were recorded there between 2000 and 2005. Territories are sized in proportion to the absolute number of people who died from HIV/AIDS. Check out the foreclosure map (click to enlarge), from RealtyTrac. Year-to-Year Real GDP Growth Was Actually 2.5%! WASHINGTON -- The U.S. economy braked sharply last autumn, pulling growth for all of 2007 to its lowest speed in five years as the housing slump took a heavy toll. Gross domestic product rose at a seasonally adjusted 0.6% annual rate October through December, the Commerce Department said Wednesday in the first estimate of fourth-quarter GDP. The 0.6% pace was much slower than the third-quarter's racing 4.9% rate. Comment: Real GDP growth in the second and third quarters of 2007 was higher than average, at 3.8% and 4.9%, respectively, and then dropped to .60% in the fourth quarter. But why does the media (see WSJ article above) focus so much on these quarter-to-quarter growth in real output? Shouldn't we also be concerned about year-to-year growth as well? That is, why do we focus so much on 4th quarter 2007 real GDP in comparison to 3rd quarter GDP (0.60%)? Shouldn't we also pay attention to the growth rate in real GDP from a given quarter to the same quarter in the previous year? After all, coming off a 5% quarter like the third quarter, it's going to be difficult to always sustain that kind of above-average growth in the next quarter, and just returning to normal growth (on an annual basis) in the following quarter might make the economy look weaker than it really is. Comparing real GDP in the 4th quarter of 2007 to the 4th quarter of 2006 (and doing the same for all previous quarters), real output grew at 2.5% in the 4th quarter of 2007 (see chart above), much higher than the .60% growth rate calculated from the previous quarter. Of course, the year-to-year measurement also brings second and third quarter growth down sharply to only 1.9% (vs. 3.8%), and 2.8% (vs. 4.9%). Quarter-to-quarter growth rates are always going to be more volatile than the smoothed annual rates from the same quarter in the previous year. Buried in today's BEA report, we find this: "During 2007 (that is, measured from the fourth quarter of 2006 to the fourth quarter of 2007), real GDP increased 2.5%. Real GDP increased 2.6% during 2006." Isn't this another possible indication that the economy is NOT in a recession? 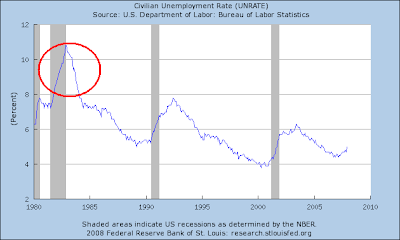 Notice that the graph in 2007 looks nothing like the graph in 2001, during the last recession (shaded area). 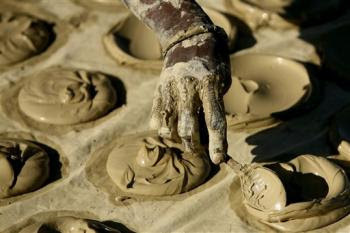 PORT-AU-PRINCE, Haiti (AP) — It was lunchtime in one of Haiti's worst slums, and Charlene Dumas was eating mud. With food prices rising, Haiti's poorest can't afford even a daily plate of rice, and some take desperate measures to fill their bellies. Charlene, 16 with a 1-month-old son, has come to rely on a traditional Haitian remedy for hunger pangs: cookies made of dried yellow dirt from the country's central plateau. Food prices around the world have spiked because of higher oil prices, needed for fertilizer, irrigation and transportation. Prices for basic ingredients such as corn and wheat are also up sharply, and the increasing global demand for biofuels is pressuring food markets as well. The problem is particularly dire in the Caribbean, where island nations depend on imports and food prices are up 40 percent in places. Response from the ethanol lobby? "Let them eat dirt." There are three ways government can get the money for a stimulus package. It can tax, borrow or inflate the currency by printing money. If government taxes to hand out money, one person is stimulated at the expense of another who pays the tax, who is unstimulated and has less money to spend. If government borrows the money, it's the same story. This time the unstimulated person is the lender who has less money to spend. If government prints money, creditors, and then everyone else, are unstimulated. Political satirist P.J. O'Rourke says that the free market exists in the eyes of philosopher Adam Smith in order to decentralize our badness. If Not the Economy, It Might Stimulate Votes? Wafa Sultan Gives New Meaning to the Word "Bad"
"Hillary, I'd like to expand government by at least this much." Gov. Jennifer Granholm tonight surpassed the previous record for government expansions proposed in a State of the State address, according to the Mackinac Center’s annual tally of proposals by Michigan governors to expand or limit the scope of government. The Laffer Curve charts a relationship between tax rates and tax revenue. While the theory behind the Laffer Curve is widely accepted, the concept has become very controversial because politicians on both sides of the debate exaggerate. This video, featuring Cato Institute Senior Fellow Dan Mitchell, shows the middle ground between those who claim "all tax cuts pay for themselves" and those who claim tax policy has no impact on economic performance. This is Part I of a three-part video series, and focuses on the theory of the Laffer Curve. Part II reviews historical evidence of Laffer-Curve responses. Part III discusses how the revenue-estimating process in Washington can be improved. 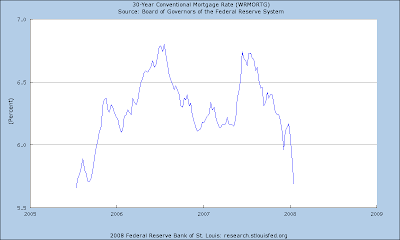 According to the Federal Reserve (via the St. Louis Fed), 30-year fixed-rate mortgage rates fell below 5.5% last week for the first time in almost 4 years (see graph above), since early March 2004. A year ago, most economic data looked much worse than they do today. New orders for durable goods fell 3.9% at an annual rate during the six months ending in November 2006 (see graph above, red circle). Real GDP grew just 0.6% in the first quarter of 2007 and retail sales fell in January and again in April. But the economy came back and roared in the middle of the year -- real GDP expanded 4.4% at an annual rate between April and September. New orders for manufactured durable goods in December increased $11.2 billion or 5.2% to $226.6 billion (Note: Expected consensus was only a 1.6% gain). This was the second consecutive monthly increase and followed 0.5% November increase. Excluding transportation, new orders increased 2.6%. Excluding defense, new orders increased 2.9%. Transportation equipment, up three consecutive months, had the largest increase, $7.3 billion or 11.3% to $71.4 billion. This was due to defense aircraft and parts, which increased $3.5 billion. Bottom Line: Durable goods orders signal a much stronger economy today than a year ago, as Brian Wesbury suggests. Further, the continued gains in durable goods orders indicate that the U.S. economy is nowhere near a recession, see the graph above (data available here) and notice the steep decline in durable goods orders before, during and after the last recession in 2001. Last week there was a CD post featuring the graph above of initial claims for unemployment benefits, which was mentioned on Greg Mankiw's blog. The most surprising finding, contrary to conventional wisdom, is that both payroll and household employment measures are of no value as recession indicators. The 1-month change in the unemployment rate has value, but is perhaps prone to false signals due to its moderately high variance. 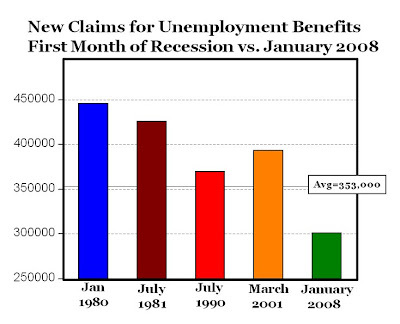 Finally, we have learned that unemployment insurance claims are very valuable and reliable pre-recession indicators. The fact that the UI data are released weekly makes it even more timely, and so it merits close attention. From the Executive Summary: The best pre-recession employment indicator is actually weekly claims for unemployment insurance (UI). Kane based his model on the three-month change in the unemployment rate and initial jobless claims. Both rose in December, which pushed up Kane’s model to signal 35% recession odds, which was still below what many on Wall Street and academia have thought. Yet the surprising decline in weekly jobless claims this month to around 300,000 — which is usually consistent with a very healthy labor market — has brought those chances down to around 15%-16%, Kane said. COLOMBIA--More than a thousand additional Venezuelan troops have been sent to the Colombian border to stop food and fuel from going to Colombia. Normally, twice as much stuff (over $3 billion worth) comes FROM Colombia, than goes in the other direction TO Colombia. But Venezuela is suffering from inflation and food shortages, and president Hugo Chavez addressed the problem by putting price controls on food. But he did not put controls on the items farmers have to buy to produce the food. Thus farmers are being forced to sell food at a loss and go bankrupt. To avoid that, farmers are smuggling their products to adjacent countries like Colombia, where they can be sold at market rates. VENEZUELA--Venezuela's top food company has accused troops of illegally seizing more than 500 tons of food from its trucks as part of President Hugo Chavez's campaign to stem shortages. The campaign has also included government crackdowns on accused smuggling, with the military seizing 1,600 tons of food and sending 1,200 troops to the border with Colombia. Troops said they halted the transport of 350 tons of food to states along the Colombian border on suspicion of smuggling, he said. Another 165 tons were impounded in an eastern state on accusations of hoarding. Bottom Line: The lessons from economics and history are very clear: Price controls haven't ever worked, they won't work in Venezuela, and they won't ever work anywhere. Chavez can attempt to ignore or circumvent the laws of economics, but he can't prevent the inevitable shortages that will inevitably result as a direct consequence of his artificial price ceilings (see graph above). "The market be a harsh mistress." The government's resources are not infinite. If it gives out $150 billion today, it must collect an extra $150 billion in taxes tomorrow (unless the government cuts spending, which nobody seems interested in). That's a law of arithmetic. Where will that future $150 billion come from? From the same people who are being encouraged to spend their rebate checks today. That's why this whole thing is eerily similar to the sub-prime lending crisis that got us into this mess — people are being encouraged to spend beyond their means and forgetting that it's all got to be paid back someday. The only way out is for people to actually earn more so they can afford to pay those future taxes. They can earn more only if they work more. They'll work more only if they have the right incentives. For $150 billion, you can hand out a lot of incentives. 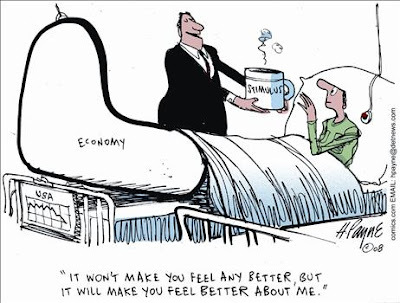 But the stimulus package is incentive-free. In China 25 years ago, over 600 million people—two-thirds of the population—were living in extreme poverty (on $1 a day or less). Now, the number on $1 a day is below 180 million. In the world as a whole, a stunning 135 million people escaped dire poverty between 1999 and 2004. This is more than the population of Japan or Russia—and more people, more quickly than at any other time in history. ~The Economist Magazine, "The World's Silver Lining: In a Week of Financial Uncertainty We Look Behind the Headlines to a World That is Unexpectedly Prosperous and Peaceful"
In May, June and July the U.S. Treasury will likely mail out $100 billion worth of checks to working households. If past experience is any guide, at least $50 billion of these funds will be spent — which together with multiplier effects will add about 3% to the annualized growth rate in the third quarter of 2008. If food stamp increases or extended unemployment insurance are added to the final package, as demanded by many in the Senate, the macroeconomic benefits would be somewhat larger.We will eventually need to pay back this money, but an extra year of lower unemployment and higher output will put us in a better position to do so. I object. The last time large numbers of people were showered with loan money and encouraged to live beyond their means, it was called the sub-prime crisis, which is what got us into this mess to begin with. Note: All week in the LA Times, Jason Furman, an advisor to President Clinton, and author-economist Steven E. Landsburg discuss the U.S. economy and the recently announced stimulus package. Standings So Far: Landsburg 1, Furman 0. From today's NY Times: Winners of eBay auctions typically pay not the highest amount they bid but the second highest amount, plus the bidding increment of that auction. In other words, there is a gap between what they pay and what they are willing to pay – a “consumer surplus” whose size eBay has never revealed, since the company does not share data on the highest bids. Researchers at the University of Maryland and the Indian School of Business have now quantified the consumer surplus by using a sniping agent called Cniper to track 4,500 eBay auctions in 2003 and 2004. By using the sniper software, the researchers could track the highest bids and measure the difference with the winning bid – an average of $4, or 30% savings on the average $14 eBay auction. Writing in an upcoming issue of Information Systems Research, the researchers report that eBay buyers saved more than $7 billion in 2003 and $8.4 billion in 2004. Extrapolating from their data, they project that consumers saved $19 billion on eBay last year. "It is hard to imagine any time in history when such rampant pessimism about the economy has existed with so little evidence of serious trouble." A recent post reported that every major U.S. commercial bank was profitable last year. An anonymous commenter reported some 2008 earnings per share (EPS) estimates for some of the banks listed in the post. That comment inspired the table above (click to enlarge), which shows 2007 EPS (actual) and 2008 EPS estimates for 17 of the largest U.S. commercial and investment banks. 1. Merrill Lynch is the only major investment bank to report negative earnings in 2007, and all other banks above were profitable last year. For 2008, $5.22 EPS is forecast for Merrill Lynch. 2. For 2008, all 17 banks are expected to be profitable, and EPS for 12 out of 17 banks are expected to increase from 2007. 1. Total U.S. retirement assets climbed to $17.4 trillion at the end of the second quarter of 2007, up from $16.7 trillion at the end of the first quarter of 2007 (see top chart above, click to enlarge). 2. Retirement savings now account for almost 40% of all household financial assets in the United States (see bottom chart). 1. As much retirement wealth was created in the last 5 years since 2002 (almost $7 trillion) as was created in the entire history of the country through 1995, when retirement wealth reached $7 trillion for the first time. 2. Retirement assets now account for nearly 40% of all U.S. household financial assets, or about twice the percentage of 20% in the mid-1980s, and more than three times the 12% share in the mid-1970s. 3. Household assets in the form of real estate have probably become much LESS important over time as retirement assets have grown in value, and real estate now accounts for a maximum of 60% of household assets, compared to a maximum of 80% during the S&L crisis and 88% during the 1970s. Bottom Line: Not only have retirement assets reached record levels, but as I wrote in a previous post recently, household wealth has increased by almost $20 trillion in the last five years ($7 trillion due to retirement assets increasing), and the average American household now owns about $528,000 worth of stuff (assets, real estate, etc. ), free and clear of any debt! In 2002, average net household wealth was about $370,000, and today it's more than half a million dollars. Therefore, in just the last five years we've become more than a third richer (+43%), which is truly amazing! Further, real estate assets represent a smaller share of all household assets than any time in history, which could be a reason why the economy can absorb the subprime crisis. NEW DELHI: Sears, yet another American retail chain, has shown interest in starting operations in India. The global retail giants (Sears, Wal-Mart, French-based Carrefour and German-based Metro) are being attracted to India like bees to honey. Bottom Line: The smell of profits has such a strong, fragrant, and redolent odor, and has a global reach! 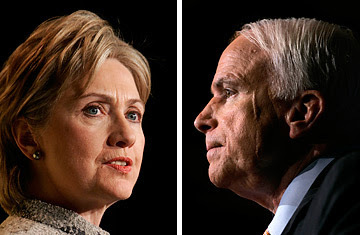 San Francisco Chronicle: With health care emerging as a chief domestic issue in the 2008 presidential race, the various candidates are pitching numerous platforms designed to reduce costs and broaden coverage. The proposals of all three Democratic candidates call for universal coverage, citing an estimated 47 million uninsured people in the United States. Early Solutions Clinics are a no-appointment-needed health care clinic that offers basic services for a fraction of the cost and reduces patient waiting time. Our board-certified nurse practitioners will provide you with quick access to quality medical diagnosis and treatment under the direction of on-call physicians. In addition, all of our clinics are affiliated with hospitals nearby should you require advanced care. Our clinics are open seven days a week, 364 days a year (closed on Christmas) in an effort to help you seek treatment at a time that is convenient for you. Hours: M - F 9 a.m. - 8 p.m., Sat 9 a.m. - 5 p.m. and Sun 12p.m. - 5 p.m. and most services cost $49. For the first time in the history of health care, everything you need to know to compare doctors, prices, locations, credentials and availability is in one place. In the Web-based marketplace, consumers can compare diagnostic imaging packages such as MRI and CT scans, annual physical, dental and eye exams and the costs of physician-recommended services such as mammography or physical rehabilitation. 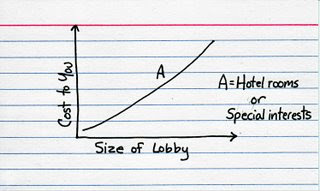 Its creators want to do for health care what Travelocity did for airline tickets. Carol's creators are riding the leading edge of a wave of change headed toward consumers just as questions about how to cure the nation's chronic health care crisis are resounding from the corner cafe to the presidential campaign trail. 1. The share of total federal income taxes paid by the top 1% of tax filers increased to 39.38% in 2005 (most recent year available), while the tax share of the top 5% climbed to 59.67%. The income tax share of the top half rose to 96.93%, according to recent Internal Revenue Service (IRS) data. The tax shares are the highest on record for these groups in comparable IRS data going back to 1986. 2. The share of adjusted gross income generated by the top 1% increased to 21.20% in 2005, relative to a level of 20.81% reached during the height of the stock market bubble in 2000 (when the income tax share of the top 1% was 37.42%). Although the income share of the top 1% is similar in 2000 and 2005, the income tax share was about two percentage points higher in 2005. 3. Between 1992 and 2000, the top one percent’s share of income jumped from 14.23% to 20.81%, an increase of nearly 7 percentage points, before slipping in 2001 and 2002. These data show that the most significant increases in this income share occurred in the 1990s, not in more recent years. The graph above shows the share of personal income taxes paid by the top one-half percent of earners from 1960 to 2001. During this period, there were 4 major reductions in marginal tax rates. 1. The Kennedy-Johnson tax cut reduced the top rate from 91% in 1963 to 70% in 1965, and the share of personal income tax paid by the top one-half percent of earners rose from 16% to 18%. 2. The Reagan tax rates in the 1980s lowered the top rate from 70% to 50% and then to 30%, and the share of taxes paid by these earners rose from 14% to 22% of the total. 3. In 1997, the tax rate on income from capital gains was cut from 28% to 20%, and this rate reduction was accompanied by a substantial increase in revenues collected from capital gains taxes and personal income taxes collected from high-income taxpayers. In fact, capital gain taxes roughly doubled from $66 billion in 1996 (the last year before the tax cut) to $129 billion in 2000, when these earners paid 31% of all taxes collected. Source: "Economics: Private and Public Choice, by Gwartney, Stroup, Sobel and Macpherson, 11th Edition"
Answer 36 questions to check you political compass here, and make sure you're backing the right presidential candidate. 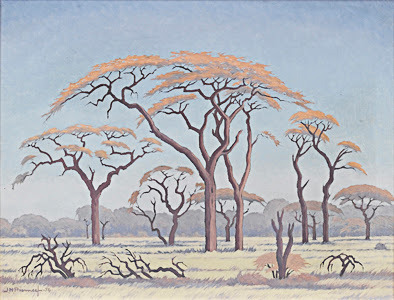 It's not only the stock markets of emerging markets that are gaining increased global interest and attention lately, there's also a global art boom going on in emerging markets, according to today's WSJ article "South African Art Goes Global:"
The growing popularity of South African art with international collectors is part of a global art boom that has seen Westerners scouring emerging markets such as China, India and Brazil for works. "What makes you think that this tax rebate will put anyone to work? The idea behind the stimulus deal is to give people tax cuts so they'll feel richer and spend more. But government can't make people richer on average; all it can do is shuffle wealth around. To pay Peter, you must tax Paul (or at least promise to tax Paul in the future, when your debts come due). Peter spends more, but Paul spends less. Moreover, even if you do somehow manage to increase spending, that doesn't mean you'll put Americans to work. More likely, you'll put Asians to work producing goods for the U.S. market. President Bush seems to have become confused on this key point because he misunderstands supply-side economics. He has vaguely remembered that tax cuts put people to work, but he's forgotten that only marginal tax cuts put people to work. Non-marginal tax cuts -- such as the ones in the stimulus package -- have exactly the opposite effect, when they have any effect at all." During the 1920s, The Revenue Acts of 1921, 1924, and 1926 reduced the top marginal income tax rate from 73% to 25% (see top chart, blue line). Did the drastic cut in tax rates cause tax revenues to fall? No, just the opposite. Personal income tax revenues increased substantially during the 1920s, rising from $719 million in 1921 to $1.16 billion in 1928 (see top chart, red line), an increase of more than 61% (this was a period of no inflation). The share of the tax burden borne by the rich rose dramatically. As seen in the bottom chart above, taxes paid by the rich (those making $50,000 and up in those days) climbed from 44.2% of the total tax burden in 1921 to 78.4% in 1928. Bottom Line: The significant cuts in marginal income tax rates in the 1920s increased tax revenues collected, and the share of taxes paid by "the rich" increased. 1. In constant dollars, the total tax revenue collected from the top 1% of taxpayers increased by 50%, from $58 billion in 1980 to to $87 billion in 1990. 2. On a per return basis, the average taxpayer in the top 1% paid 23% more taxes in 1990 compared to 1980 (inflation-adjusted real dollars). Bottom Line: As the Laffer Curve predicts, significant cuts in the highest marginal tax rates during the 1980s caused both: a) total tax revenue collected (in real dollars) from the top 1% to increase, and b) the tax collected per return (in real dollars) for the top 1% to increase. Cost of a 3-minute call from Denver to NYC: $11. First NY Times website in November 1996. In 1996, the Internet Archive began archiving the web for a service called the Wayback Machine, where you can browse through 85 billion web pages archived from 1996 to a few months ago. The top graphic above shows one of the very first Yahoo websites on December 20, 1996, and the bottom graphic shows the very first web site of the New York Times on November 12, 1996. The World Wide Web sure has come a long way in the last 12 years. 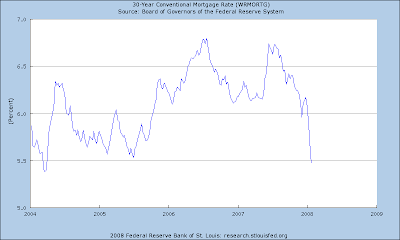 30-year fixed rates for conventional mortgages (5.69% as of last week) are the lowest in 2.5 years, since since July of 2005 (see chart above). Chief Executive’s fourth annual “Best & Worst States” survey recently asked 605 top executives to evaluate their states on a broad range of issues, including proximity to resources, regulation, tax policies, education, quality of living and infrastructure. CEOs were also asked to grade each state based on the following criteria: 1) Taxation & Regulation, 2) Workforce Quality, and 3) Living Environment. Carpe Diem Chart on CNBC's "Kudlow and Company"
The CD graph above (from today's CD post) was featured tonight on CNBC's "Kudlow and Company." Here is a video link of the 5:35 minute segment, the discussion of the graph above occurs at about 1:30. Using recent data, it would appear on its face that the Democratic proposal to raise taxes on the upper-income earners, and lower taxes on the middle- and lower- income earners, will result in huge revenue losses on both accounts (see diagram above, click to enlarge). ~Arthur Laffer in today's WSJ, "The Tax Threat to Prosperity"
The chart above (click to enlarge) shows pay around the world for the positions "Head of Marketing and Sales" and "Data-Entry Operator," according to Mercer. Also listed is the cost of living rank and expected pay increase in 2008. 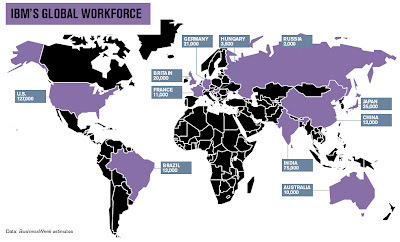 From Business Week (1/17/2008): "Big Blue has built a global network for client services and in the past three years has hired 90,000 people in low-cost countries." Globalization is Good for Michigan, Good for U.S. 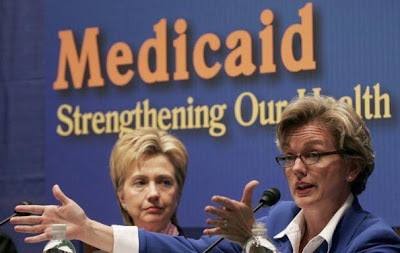 Political rhetoric: According to Governor Jennifer Granholm, "No state has been ravaged more than Michigan by unfair trade policies." 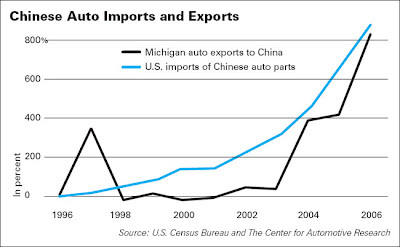 Economic reality: China's demand for Michigan vehicles and auto parts has exploded and has grown by a factor of 10X since 2001 (see chart above), and demand has also increased for other Michigan exports to China like inorganic chemicals, machinery, medical instruments and soap. Source: The Mackinac Center for Public Policy's report "Globalization is Good for Michigan" by James Hohman. Bottom Line: Exports and imports are two sides of the same coin of international trade. In other words, trade works both ways, and increased imports of products FROM China = increased exports of U.S. products TO China. The chart above shows the number of new claims for unemployment benefits in the first month of the last four official recessions using data from the Department of Labor (claims) and the National Bureau of Economic Research (recession dates). At the onset of each of the last four recessions (1980, 1981, 1990 and 2001), initial claims for unemployment benefits were above the average of 353,000 (from 1967), and in most cases, way above average. The two most recent reports of 301,000 claims (week ending January 19) and 302,000 claims (week ending January 12) suggest that the labor market is healthy and resilient, not weak and anemic. Bottom Line: If there is going to be a recession in 2008, it definitely did NOT start this month. We are NOT in a recession. It's a good point to adjust for the increasing size of the labor force over time. Using the percentages above for previous recessions and the size of the current civilian labor force (about 154 million), we would have to see somewhere between 415,000 and 615,000 new claims for unemployment benefits before we would start to approach the levels of new claims at the onset of the last four recessions. At 301,000 claims, we are nowhere NEAR those levels. Not even close. Do You Think Your Text Messages Are Private? 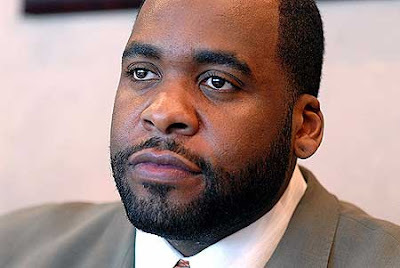 Kilpatrick and chief of staff Christine Beatty denied during testimony in August that they had a sexual relationship. But the records, a series of text messages, show them engaged in romantic banter as well as planning and recounting sexual liaisons. The newspaper examined nearly 14,000 text messages on Beatty's city-issued pager. The exchanges, which the Free Press obtained after the trial, cover two months each in 2002 and 2003. The false testimony potentially exposes them to felony perjury charges, legal experts say.